A gooey, orange bowl of macaroni and cheese may be a staple of many Canadian childhoods (and dorm rooms), and the company serving the dish is trying to capitalize on that meal-time nostalgia with its new name. 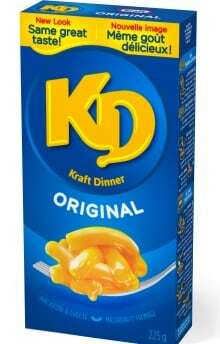 Kraft Dinner officially changed its name in Canada to what it's been known as in households here for years: KD. Often, companies change their brand names when things go wrong, naming consultants say. Like if they're faced with a trademark lawsuit or have been thrust into the spotlight when something's gone wrong. Blackwater, for example - a private U.S. military company that operated in Iraq and faced scrutiny when some of its guards shot and killed more than a dozen Iraqi civilians - changed its name twice in the years following the scandal. But Kraft is no Blackwater. Kraft is rebranding its classic product to help its former customers recall those positive childhood memories, KD's brand director said this week, to persuade them to reach for its macaroni and cheese boxes at the grocery store once again. Marketing experts are not surprised. "There's been a lot of blowback against ... corporate food conglomerates, and they're trying to move away from that image in any way that they can," says Steve Manning, the founder of Igor, a naming agency. Part of that reshaping is trying to emulate their smaller competitors, he says. For Kraft Dinner that means taking on companies like Annie's - a natural food maker whose main product is also mac and cheese. The company has been eating into Kraft's market share, Manning says. Annie's name and branding, which revolves around the organic farmer founder Annie Withey, is simply warmer, more personal and more inviting than that of a conglomerate like Kraft, says Manning. "There's nothing really warm and fuzzy about saying Kraft Dinner," he says. "But when you say KD... you could be talking about a friend." With this change, he says, KD is trying to present itself as friendlier and more human. KFC, formerly known as Kentucky Fried Chicken, made a similar shift, he says, when it rebranded to just the acronym. Canadians were already calling Kraft Dinner KD, says Kristen Eyre, the product's brand director. The company decided to capitalize on that "term of endearment" and Canadians' affection for the brand, she says. But there are other reasons the name Kraft Dinner may have been sacked. Eyre did say the company's recent market research found its relevance among millennial families softening. While they still love the product, she says, many millennials don't think of Kraft Dinner as often anymore "because they feel like they've outgrown it emotionally or functionally." When a company's sales slip, says Naseem Javed, the founder of ABC Namebank, a company want to create a more hip image. The macaroni and cheese maker may also be looking to get rid of some negativity associated with the words Kraft or Dinner, he says. KFC, for example, faced public scrutiny for the word fried and cooking unhealthy food, says Javed. While the food may have stayed the same, the negative connotation disappeared when it was rebranded as KFC. It's possible Kraft Dinner became associated with "cheap or tasteless" food, he says. But KD could "give it a new vitality." Changing brand names is a fairly common strategy, Manning says, particularly if it goes along with other moves. "A lot of times people will use a name change to sort of demonstrate that they're doing something differently going forward," he says. Research in Motion, for example, changed its name to BlackBerry in January 2013. That same day, it launched two new BlackBerry 10 phones. "As we launch BlackBerry 10 around the world, now is the right time to adopt the iconic BlackBerry name," the company said in a press release at the time. The move signaled a shift that the company would be focusing primarily on its smartphone, Manning says. KD's already promising one major change. The company will remove synthetic colours and artificial preservatives from its macaroni and cheese by the end of 2016. It's one of several companies to take these steps as consumers have been strong-arming companies into being more transparent about how food is made and what goes into it. These are "baby steps" to bringing the product more in line with competitors like Annie's, says Manning. "People are gravitating towards the warm and fuzzy, and away from the cold and corporate when it comes to food." But Eyre is mum on any more upcoming changes to the signature dish, only saying that KD is always looking to evolve based on consumer demand and leaving the door open for more future tweaks to the iconic Canadian dish.